Today I have a scrapbook page to share with you. 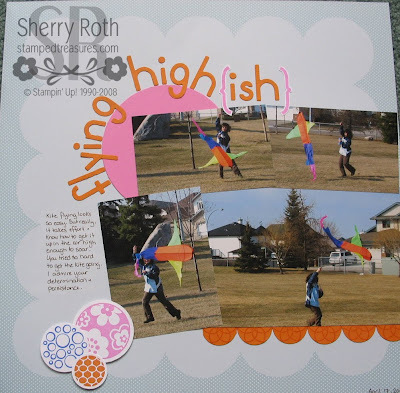 This layout began from the sketch that we are doing at my scrapbook clubs this month. This is the left page of the sketch only. I had some photos of my daughter left after scrapbooking some of my son, so I decided to use the same layout but only had enough photos for one page. The photos were taken a couple years ago when we decided we would go fly our kite. Jordyn and I both had a hard time getting the kite up in the air - thus the title. My son on the other hand managed quite well. I will share his layout tomorrow. This page strays a bit from my usual scrapbooking style but I love how it turned out. The dsp is a sheet from the Sweet Pea Paper Stack (117161). I love this paper stack - it is so versatile and has a nice assortment for both feminine and masculine projects. The stamp set I used for the accents is one that I tend to turn to when I'm just not sure what to use - Circle Circus (115778). If you look closely at the scallop border below the photos, you can see that I've stamped one of the images from this set onto Pumpkin Pie cardstock and then punched it out using the 1" circle punch. Hope you like todays page. Thanks for stopping by. Click here to order Stampin' Up! product online 24/7! Only 8 days left to get free product with your $65 order. Click here for more details.